Calculate the formulas with respect to resistance by entering variables. Insulators resist the flow of the electrical current, such as glass, wood or plastics, and conductors conduct the flow of the electrical current easily due to their free atoms in their valence shell. The opposition to the flow of the electrical current is different for every material in an electrical circuit and the measure of this term is called resistance. Resistance, in electricity, property of an electric circuit or part of a circuit that transforms electric energy into heat energy in opposing electric current. Resistance involves collisions of the current-carrying charged particles with fixed particles that make up the structure of the conductors. 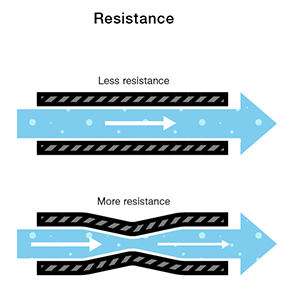 Resistance is often considered as localized in such devices as lamps, heaters, and resistors, in which it predominates, although it is characteristic of every part of a circuit, including connecting wires and electric transmission lines. The dissipation of electric energy in the form of heat, even though small, affects the amount of electromotive force, or driving voltage, required to produce a given current through the circuit. In fact, the electromotive force V (measured in volts) across a circuit divided by the current I (amperes) through that circuit defines quantitatively the amount of electrical resistance R. Precisely, R = V/I. Thus, if a 12-volt battery steadily drives a two-ampere current through a length of wire, the wire has a resistance of six volts per ampere, or six ohms. The ohm is the common unit of electrical resistance, equivalent to one volt per ampere and represented by the capital Greek letter omega, Ω. The resistance of a wire is directly proportional to its length and inversely proportional to its cross-sectional area. Resistance also depends on the material of the conductor. - Enter Rn values up to 'n' by using comma instead of space.